As an advanced paramedic, my job falls into two main parts. First, I respond to the more serious incidents, such as major trauma – for example major road accidents, falls from a height, serious burns and so on – as well as cardiac arrests to provide clinical support and leadership. I carry some additional equipment and medications to support these challenging incidents. My other role, which I am doing today, involves working in our Emergency Operations Centre (EOC), where emergency calls are received and ambulances are dispatched. It’s 11am and across our Trust area we have over 100 waiting emergency incidents. These are incidents to which we currently have no ambulance to send. This may sound unbelievable, but this is not unusual at this time of the year. Like every ambulance service, we prioritise received calls so that the most serious emergencies get an ambulance as soon as possible. This means that some people with less serious conditions have a longer wait than we would like. I am constantly scanning the waiting “stack” to see if there are any emergency incidents that need upgrading. At the moment, we have a patient in labour, another with chest pains and a child fallen off a climbing frame, all of whom are waiting for a vehicle to be assigned. Suddenly, a Category 1 call comes in – our highest priority call. A child has choked and can’t breathe. An ambulance responding to another incident is immediately diverted, along with one of my advanced paramedic colleagues. This delicate juggling act of matching our resources to the increasing demand on the ambulance service is occurring daily in ambulance control rooms across the country. Unfortunately, sometimes the 999 system is used for inappropriate reasons and we receive many calls to the ambulance service who could use alternative options, such as the NHS 111 phone number or recently-launched online tool. Whilst toothaches, colds and coughs are unpleasant, a well-stocked medicine cabinet can help relieve the worst symptoms. Keeping the 999 system free for the most serious of calls helps us reach everyone more quickly. 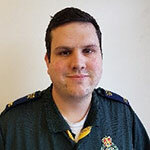 Dave Blowers is an advanced paramedic with North West Ambulance Service, covering West Cheshire and the Wirral. He started his paramedic training with London Ambulance Service and the University of Hertfordshire in 2000. He currently lives with his partner and two cats in Chester.